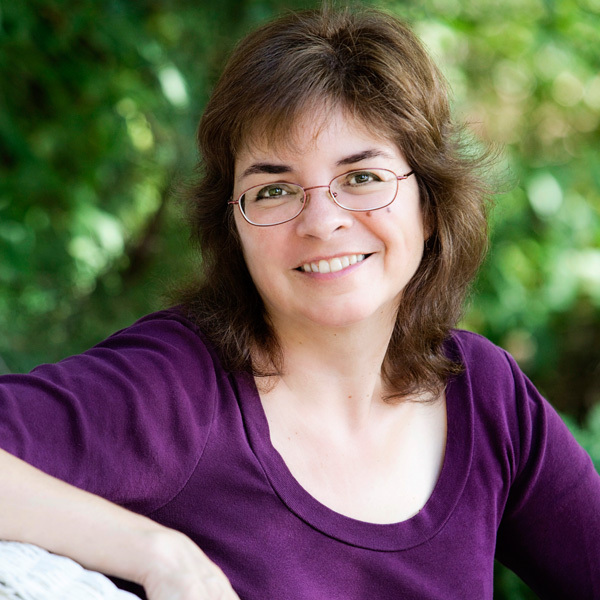 Leslie Budewitz is my guest today! Just one warning her stories will make you HUNGRY!!!! The Last Best Place. That’s the newest slogan for my home state of Montana, also dubbed the Big Sky State for our magnificent views, and the Treasure State for our gems and minerals. All that makes Montana a great vacation escape—for a few days, a week or two, or all summer long. Winter, too, even if your idea of winter sports isn’t skiing or snowshoeing but curling up in front of a crackling fire with a double mug of hot cocoa. Turns out Montana is also a pretty good place to escape the past. More than one Jewel Bay resident came here in search of a fresh start. A new job, maybe a new name. A new life in a place where people don’t ask questions. But when murder intrudes on village life, questions pop up like morel mushrooms on the forest floor. And the sheriff’s deputies aren’t the only ones digging up dirt. Erin Murphy returned to her hometown to take over the Merc, her family’s struggling shop in the century-old sandstone building her great-grandfather built as the town’s first grocery. When people she loves are killed—or accused—she can’t help poking around. Her own past gives her ample reason to not trust the resident sheriff’s detective as much as she’d like to—but she’s working on that. Ever the business owner, Erin uses her Spreadsheet of Suspicion to plot her questions and track the answers. And sometimes, those trusty cells and columns lead her places where others would rather she did not go. In Crime Rib, second in the series, the TV show Food Preneurs comes to town to film the 35th Annual Jewel Bay Summer Art and Food Festival and the annual steak grill-off. Erin’s content to help from the sidelines, freeing her to focus on the Merc, and to scout the festival vendors for new products. When the show’s producer is killed in a hit-and-run, Festival organizers beg her to step in and help out, to give Jewel Bay a shot at national publicity. How could a local girl say no? But when the host shows her a less than camera-ready side of himself, and a contestant is attacked and killed, Erin worries that the town’s reputation as a family-friendly, food-loving, vacation village will go up in flames. And when the sheriff runs out of leads, it’s up to her to smoke out the truth. But just as in real life, some folks would do nearly anything to keep their secrets to themselves. To make sure the past stays behind, by making the Last Best Place Erin’s final resting place. I hope you’ll make the trip with me, on the page, to see how Erin makes her own escape—and brings justice to her corner of the Big Sky. 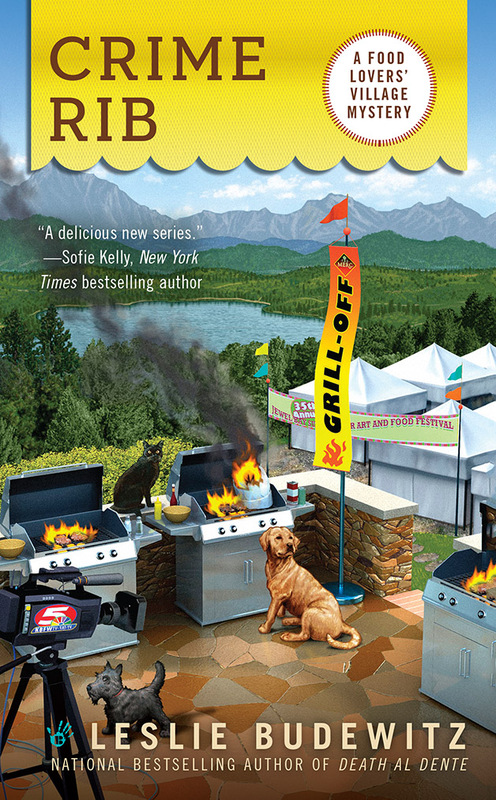 Leslie Budewitz is the national best-selling author of Death al Dente, first in the Food Lovers’ Village Mysteries set in northwest Montana, and winner of the 2013 Agatha Award for Best First Novel. Crime Rib, the second in the series, came out July 1, 2014, from Berkley Prime Crime. Her Seattle Spice Shop Mysteries will debut in March 2015. Erin is one busy lady before adding murder to the mix but that doesn’t mean she is going to stay at the Merc and miss all the action. Having one of the hottest foodie programs, Food Preneurs, comes to town to cover the grill-off is an awesome opportunity for “The Food Lover’s Village”. Erin is not going to let one dead chef and a suspicious accident ruin a weekend of publicity for the town, but she is going to make sure it is the right kind of publicity. She is also going to track down the killer/s. Budewitz has given us some fantastic characters to follow in this story. In addition to the murder mystery there is a little family disagreement about remodeling the courtyard and some secrets. Romance may be on the horizon for Erin with 2 eligible bachelors vying for her attention. One shopkeeper is a little cranky about all the foodie fuss. Of course there needs to be an obnoxious character and the TV Host for Food Preneurs fills that spot nicely. She also gives a couple of interesting mysteries to solve. Plenty of viable suspects with motive, but who had the means and opportunity? I love the way Erin uses a spreadsheet to keep track of the clues. Part of the pleasure of this series is the way the author describes all he food. She had my tummy growling several times. Thankfully she gives recipes because I definitely want S’more of the S’MORE SANDWICH COOKIES, and the CHOCOLATE MOUSSE CUPS and the GRILLED FLANK STEAK and everything else that was featured in the pages of this book. This story has a well plotted mystery, a bit of comedy, yummy food and engaging characters. To me that is recipe for a marvelous cozy mystery. Leave a comment for Leslie for 5 Bonus Entries ! Your books are great! I also like the Spice Shop Mysteries. I love cozies with recipes. Can’t wait to get back to Jewel Bay and solve a couple of mysteries. Thanks for giving me a smile, Annette! Oops — I mean Alicia! 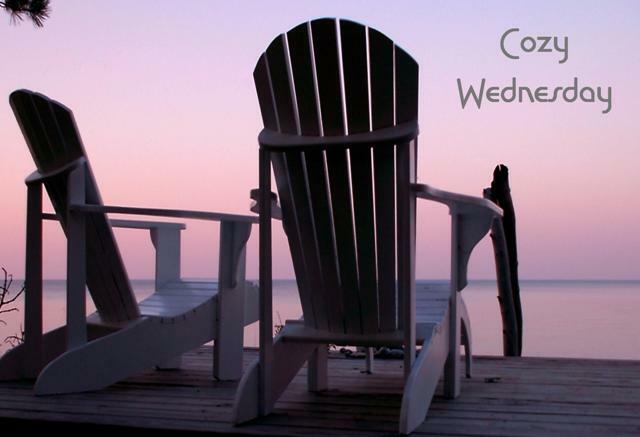 Would love to win Crime Rib…thanks for the review & giveaway! Crime Rib is intriguing and unique. Thanks. This looks like a really good series. I so want to read it. I am currently reading Crime Rib and love it. Loved the first book as well. Thanks for all the kind words, and to Lori for the chance to join you here today AND the terrific review! I love cozy mysteries and look forward to reading more of them. I love dogs too, so this is especially inviting. Sherry, Duke the Retriever has quite an adventure in Crime Rib! Enjoy! I’m hungry already. Can’t wait to read this. I love the title, and the recipes sound good too! Kathy, more recipes on my website and in my quarterly newsletter! Hope this one is a winner too!! This sounds like it will be a lot of fun to read. Thank you Leslie for a good intro to your newest in the series. And, thank you Lori for the review. I’ve yet to read the first one: Death al Dente. I need to play catch up! Thanks for the chance to win. I am looking forward to reading Crime Rib! 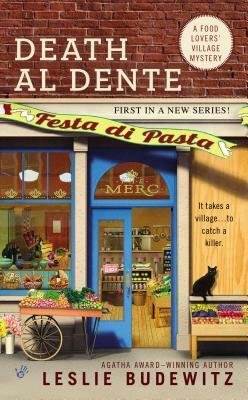 Death Al Dente was a really fun read—I’ve been waiting for this next book to come out. Thanks, Sue — so glad you enjoyed Death al Dente! I don’t cook much any more but I love the cooking shows! This sould be a terrific read. Crime Rib sounds fun, I love my food shows, so the theme sounds perfect for a good cozy. Funny title that definitely got my attention. I like to cook and think this mystery sounds like my kind of read. Looks like another great addition to a great series. You make me want to visit Montana! congrats & continued success, Leslie!!! Leslie, I am looking forward to reading your books and I was wondering did you have a mentor when you first began writing? Jenn, no one mentor, but I got a lot of encouragement from other writers. Eventually, I helped start the Guppies (“Great Unpublished”) chapter of Sisters in Crime, so we could help mentor each other, and later, after a move, joined the Authors of the Flathead, a multi-genre writers group where I also found a wonderful critique group that helped me tremendously for several key years. So much help from so many directions that I am determined to give it back whenever I can! Thanks for asking. I have been planning on reading this series. Thanks for the giveaway! This book sounds like something I would enjoy reading. I can’t wait to read this. Your mysteries are such fun! I have been wanting to try your mysteries. They sound great. Thanks for the giveaway. Love the title and can’t wait to check this out! Thanks! Fun series! I look forward to reading the latest book! Congrats on all your success with your series. I knew when we were Guppies together you’d go far! Thanks, Carolyn! Enjoy the trip to Jewel Bay! do you find yourself making title puns every day, then having to write the stories? Laura, so glad you like the titles! They are a result of brainstorming with my agent and editor, and I like to get friends and readers involved, too. The story comes first, then the word play fun!